A system that is as easy to use as it is filled with functionality. You won't like the price tag - but it performs up to par. It’s time to take your Farming Simulator game to the next level. If you’re the type who likes to “Go big, or go home,” then have I got the controller for you. Sure, you can continue eking out a decent game of Farming Simulator ’15 Gold Edition with your plain old gaming mouse, but you certainly aren’t going to be bringing your “A” game – and besides, if simulators are your thing, why not make your gaming experience as realistic as possible? The Heavy Equipment Precision Control System from Saitek is the ultimate in tractor driving simulation…and it’s able to rock way more games than just Farm Simulator. So, if you decide to make the ultimate investment (or even better, put it on your wish list so others can invest for you), make sure your gaming setup has got plenty of space. The Heavy Equipment system arrives in a gigantic box, and the pieces inside will take up a bit of room on your desk. 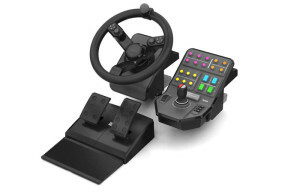 The system includes the heavy equipment wheel, a side panel control deck, and foot pedals, and we’ll take a look at each one individually before looking at the system as a whole – but as far as initial setup goes, you’ll find it quite simple. 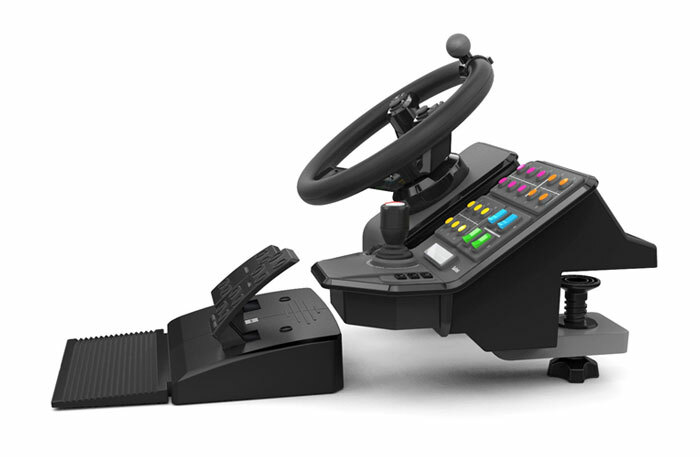 The foot pedals plug into the side of the steering wheel, and then the steering wheel and control panel plug into your gaming rig via USB (yup, you’ll need two slots free if you want to use the whole rig). Easy-peasy. The heavy equipment steering wheel sets on a rather bulky piece of plastic, but you’ll find that gives it enough of a base to take whatever your game can dish out. You can screw it right onto the edge of your computer desk, and it rests securely without wiggling (and it doesn’t damage your desk either). The steering wheel itself is nicely sized, and contains plenty of controls to up your game. The wheel turns easily, and is large enough that your hands can grip it securely - and there’s even a turn knob for easy one hand cruising. The center of the wheel has a horn button (niiiice), and the prongs coming out from the center to the left and right both have four-button pads and control sticks as well as a button in the back, giving you plenty of control right at your fingertips. The foot pedals plug in to the steering wheel, and they have two pedals – gas and brake/reverse – in the standard formation. There is also a foldout foot pad that lengthens the size of it and provides a nice grip for the ball of your foot to rest on. Finally, you have the side panel control deck, which has enough shiny, candy-like buttons on it to make a grown gamer weep tears of joy, There are twenty-four (twenty-four!) 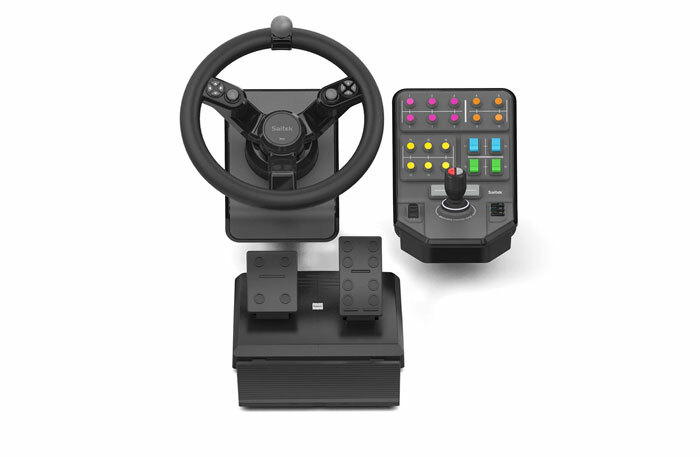 color coded control buttons on the panel, as well as a scroll wheel, and a multi axis control output joystick that rests front and center for easy access. The whole thing screws securely onto your desk as well (I did tell you you’re going to need to make room for this thing). As for how to work the whole thing – well, you won’t find a manual in the box, but honestly you probably won’t need one. For one thing, there’s no software to download – the whole thing will work just fine with your Windows 10 rig, right out of the box. As for all those buttons, they are completely customizable, but that’s quite simple as well, as it’s done in-game. Just open your controller options once you’ve launched the game, and you’ll be able to set it up however you like, no headaches involved. It’s really a plug and play system, which translates to less time trying to figure everything out and a whole lot more time actually gaming. Despite having legitimately grown up on a farm, I am awesomely bad at Farming Simulator. 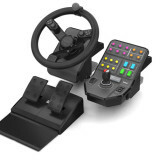 Regardless of your skill level, the Saitek Heavy Equipment Precision Control System will have you cruising your fields in style – and having a blast while you’re doing it. If you’re the type who just wants a realistic experience, you’ll find that in spades with this system. And if you’re the type who loves to modify and customize your controls, you’ll be happy as a clam with literally dozens of buttons to configure, both for Farming Simulator and any number of other games. It’s a great system that works well and is easy to set up – and really, what more could you ask for?